A mix of independent animation. You’ll see lizard adventurers, puppet politicians, and surrealist rhinos. Encore presentation of the original “Yamasong” short. An automaton girl and tortoise warrior journey with a band of outlaws on an incredible quest. Their one hope to defeat a sinister mechanized army and save the creatures of their world is to find a legendary relic. Talk back with director Sam Koji Hale and producer Mallory O’Meara. A fantasy-adventure puppet feature voiced by Nathan Fillion, Abigail Breslin, Edward Asner, Malcolm McDowell, Whoopi Goldberg, Peter Weller, & George Takei. Q&A with director Sam Koji Hale and producer Mallory O’Meara. But we’re not just showing the movie! Yamasong director Sam Koji Hale and I will also be doing a number of panels and talks about puppetry, film-making and producing. If you’re a fellow filmmaker or curious about film or working with puppets, please come check out the talks and don’t be shy! Sam and I are happy to talk about what we do, answer questions and hear your film-making stories. We’ll both have Yamasong postcards to give away, as well. DragonCon attendees should take advantage of Sam’s puppetry workshops to see not only how puppets are made, but the mechanics of how they move and are puppeteered! For those interested in writing or creating their own puppet films, check out Sam’s Writing and Directing for Puppets panel. For more general information about putting together a film, come see me on The Art of Film Production panel. The very best part of showing our movies at film festivals is getting to connect with colleagues and fans. Sam and I are so excited to meet fellow genre nerds, puppet lovers, filmmakers, and cinephiles. See you at DragonCon! Description: This is where to go to start your 4 days of film. We’ll talk about what to see & what to do, & perhaps give you a sneak peek at one of our top shorts. Description: Under The Puppet is a monthly show that talks to professional puppeteers about the art and business of puppetry. Join in the fun as host and 2018 Podcasting Hall of Fame inductee Grant Baciocco, along with special guests, record a live version of the show that will include your questions! Title: The Art of Film Production: What Do Producers Do, & How Do They Do It? Description: Our film producers will explain the nearly inexplicable job of producing a film, how they got into the field, & what they do to make a film real. Description: An interactive workshop/contest on body mechanics and collaborative movement in table top puppetry. Open for 15 Dragon Con participants that will be chosen from a lottery. The winning team will be invited to participate in Round 2. Description: Writing & directing a gonzo project is like trying to put together a puzzle with all the pieces on fire. A gonzo project with puppets is like that only more difficult and rewarding. This talk benefits new artists while offering a safe space for old vets to discuss their stories from the front line! Description: An interactive workshop on body mechanics and collaborative movement in table top puppetry. Open for 15 Dragon Con participants that will be chosen from a lottery. The winning team will face off against the Round 1 Winners for the title and prizes! Description: Bring your homemade puppets, & our team of professional puppet builders will give you tips & constructive criticism to take your puppet-building skills to the next level! Previous post Yamasong & Dark Dunes at DragonCon 2018! 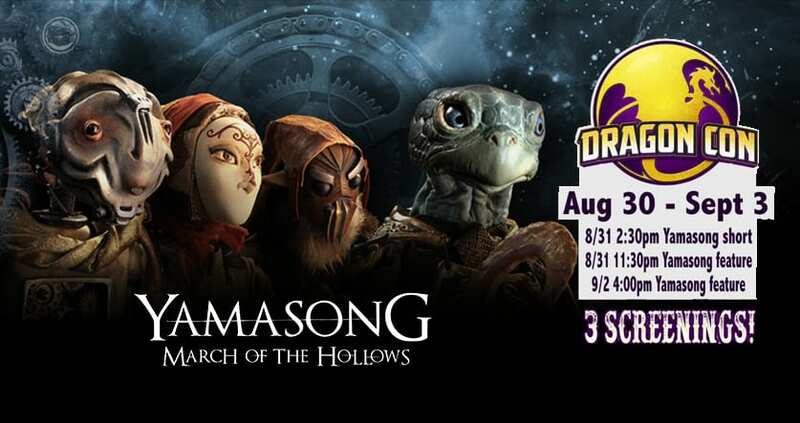 Next PostWe took Yamasong to DragonCon – A recap!